Is Memorial Day for the Living Or the Dead? Memorial Day used to be called Decoration Day in most places in the United States. This annual event probably started as a memorializing of soldiers who fell during the Civil War, at first only the Union soldiers and then, a little later, even the slain Confederate soldiers. Somewhere around the beginning of the 20th century, the general public adopted the event for their dead loved ones, regardless of military experience. I had about twenty minutes to kill yesterday before my haircut appointment, so I decided to walk through the cemetery that abuts the parking lot to the hair salon. The sign says “Historical Smithfield Cemetery,“ a notice that piqued my curiosity about why it was historical. I found two graves of interest to me. The first was the grave of Eli Smith, recognized as the donor of the land for the church and cemetery and for whom the original town of Smithfield had been named. The second I stumbled upon, but was glad I did, was for Clarence Cobb , “The barber of Smithfield for 65 years” as the marker read. “Barber” Cobb cut my hair for all of my teenage years. I would ride my bicycle to Smithfield, walk in his little barbershop, get my burr haircut (we call it a buzz now, I think), get my neck shaved with the strap razor, and talk local baseball. Good memories of small, insignificant moments—maybe that is what Memorial Day is about. Memorial Day is not really a religious holiday, like Christmas or Easter–it’s more like Veterans Day—but maybe it should be! How should Christians feel about those they have buried? I’ve long felt like our tradition does not have a very highly developed theology of death. At most we do some lip service to deceased Christians resting in Abraham’s bosom, drawing on Jesus’ teaching on the rich man and Lazarus (Luke 16:19ff). We certainly believe in the resurrection of the dead, but are uncertain about how physical that resurrection is. We believe and preach eternal reward and eternal damnation, but we can’t really imagine either and both bring with them divisive questions. I experienced one of the more shocking expressions of Christian theology in Germany during the 70s when the son of our landlord was killed in a car accident. Shortly, thereafter, his father died of lung cancer inside the ambulance outside of our office. We attended both funerals at the local protestant church (Evangelische Kirche), and in neither funeral was there mention of resurrection or heaven; the deceased live only in the hearts of their loved ones. Is Memorial Day only about our memories of the dead? Are our loved ones and those we honor still dead in those coffins under the ground upon which we stand? I’ve come to believe very strongly and very literally in the words Jesus spoke to Martha, “The one who believes in me will live, even though they die; and whoever lives by believing in me will never die“(John 11). What a difference it makes if we believe the deceased are alive! Perhaps we should view death as a transition from life to life– not such a big transition–one completed with no significant loss. Perhaps we should not mourn as those who have no hope. We do not mourn that a planted seed will be transformed into a beautiful flower. We do not mourn the loss of a precious seed because we know that it was intended for planting (1 Corinthians 15:35-44). Perhaps we should be more aware that the Body of Christ lives, including those members who no longer live with us! The saints and witnesses of Revelation are all quite active in the plan and will of God, working on behalf of the saints and witnesses who breathe. Perhaps we would be less afraid, knowing that Death has lost its sting. 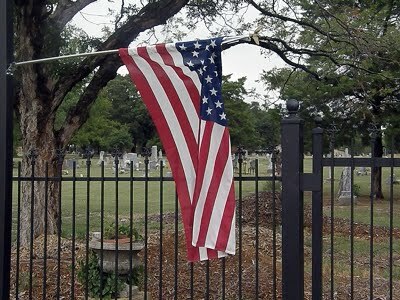 Because “the last enemy to be destroyed is death” (1 Corinthians 15:26), Memorial Day is safe and secure, as are the funeral homes and cemetery owners. Our appointment with dying is unavoidable. But what would be different for you if on this Memorial Day, you remembered that those by whose graves you stand are alive—very much alive? I mean to write a comment is hard – not that your words are hard or harsh. You are correct that we don’t have a highly developed theology of death – but we have plenty of useless and sometimes hurtful and non-scriptural cliches. I have found however, that my brothers and sisters who have experienced pain and loss have deep spiritual concepts of the meaning of death and the hope of resurrection. We need to learn to communicate these and not be afraid of expressing our feelings, doubts, questions and beliefs. Thank you. Comforting and so true. Your thoughts here Mark are both enlightening and encouraging. Wonderful words to start today with. Thank you. Truly death is like door everyone goes through, some sooner, some later, only the destination differs and so the kind of life after death will. My dear friend Hamzeh, whos 2 siblings went ahead of us is, although severely multiple handicapped, is clearly aware that we water their garden here (meaning caring for their burial place) but they are not here but with our Lord and there is life without any limiation for them. In our memories they are very much alife, he joins even in when he listens (he is blind) to a video from older times. What a privilege that we have the ability to remember!